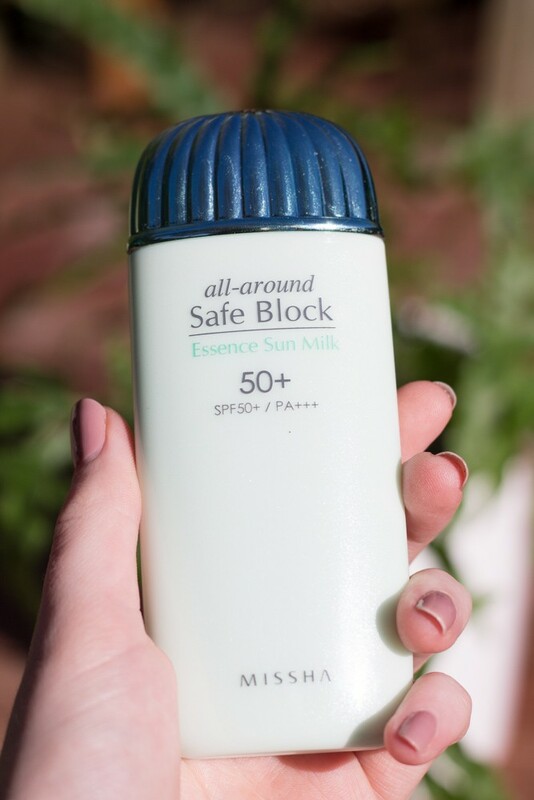 As you may know I’ve been using my holy grail fragrance-free Sunplay Superblock for coming up to 1.5 years now, and I love it. But it has its flaws. 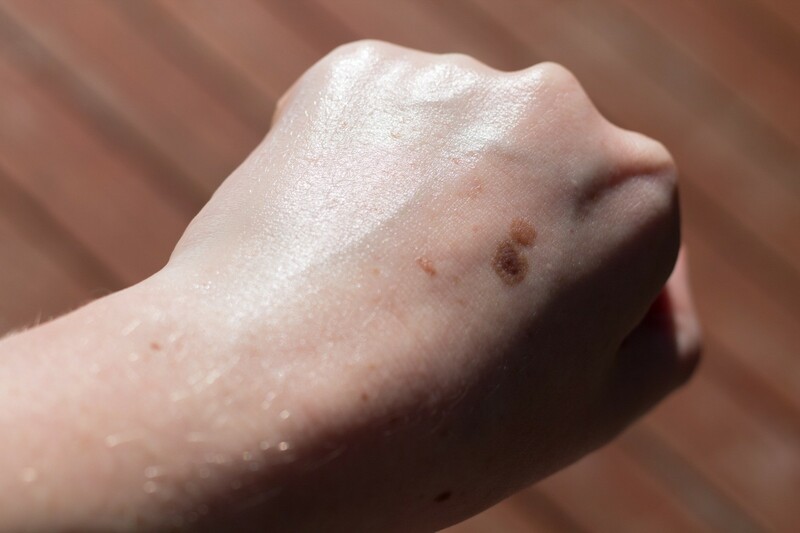 Namely the telltale white cast of zinc oxide and the slippery, siliconey, greasy feeling and shine it can leave. I sometimes reach for Biore UV Perfect Milk which, while having no white cast, is very powdery and a little drying. I wanted something in the middle – a lightweight cream that’s hydrating but leaves no greasy film or white cast. It was time to step away from my beloved Japanese sunscreens and try something new. 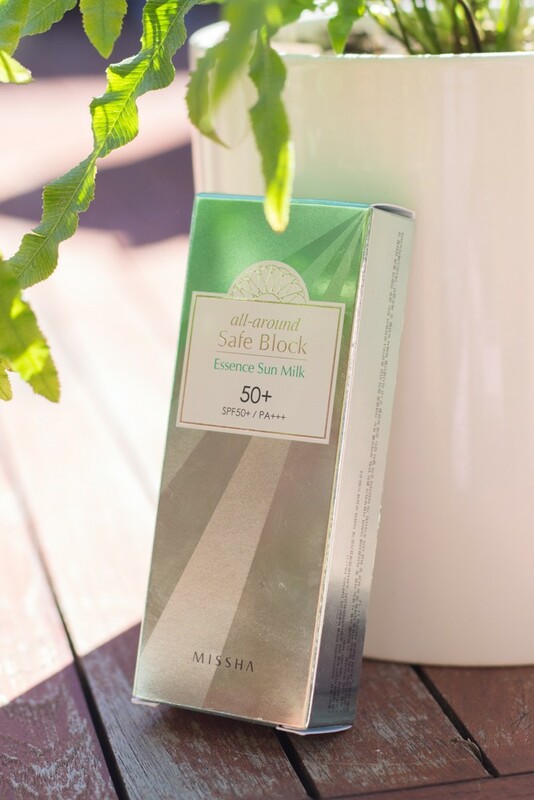 When I laid my eyes on Missha All-Around Safe Block Essence Sun Milk in a local Korean beauty store, I knew it might be the one. I’d read about it online and it seemed to fit my needs exactly. I excitedly bought it for $28 AUD (though it’s cheaper online) as I wanted to try it NOW. And I have been trying it – here’s what I think. 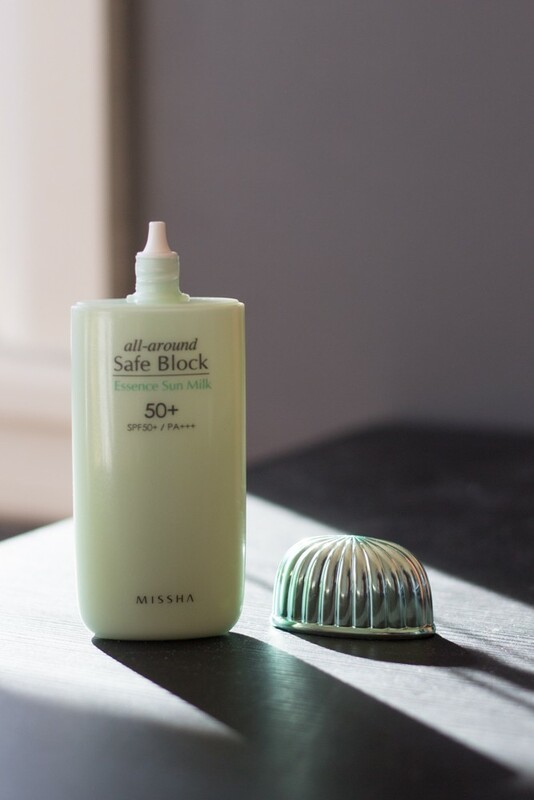 This gorgeous mint coloured paddle shaped squeezy bottle with a chrome finish lid contains a massive amount (by asian sunscreen standards). The lid twists off to reveal a fine tip nozzle which is great for dispensing directly onto the face or into your hand. I dislike the large cap however as it’s a bit clunky to twist on and off and is not very ergonomic. That’s a long ingredients list! It contains more alcohol, essential oils and plant extracts than I’d like in my ideal product, but they give the sunscreen its distinct fresh and moisturising sensation. The product feels very lightweight and cooling, like a gel-cream. It does have a strong alcohol smell but also a candied citrus (maybe grapefruit?) perfume which is quite overpowering. The cream is a very pale green colour. Once you apply it, it dries down super quickly to an invisible finish. Not powdery, siliconey or greasy, just nothing. There is absolutely zero white cast. Unfortunately, this comes at the cost of its PA rating (UVA protection) which is only +++ rather than the maximum ++++. Its SPF (UVB protection) is a great 50+. 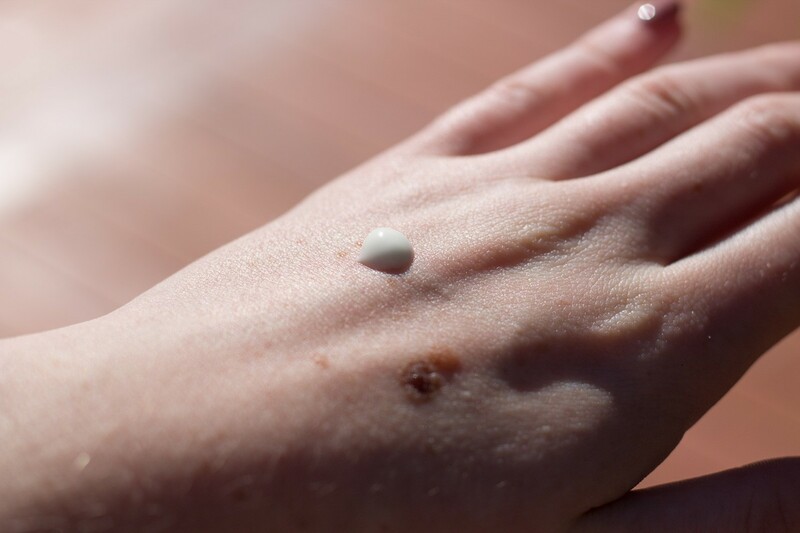 Rubbed in, this sunscreen is invisible! The dewiness shown here dries down very quickly. Wearing this product was awesome. It felt moisturising, looked great (read: like nothing) all day and I didn’t even get sunburned at a theme park for 6 hours with no reapplication. Score! Or so I thought. I have very sensitive acne-prone skin, particularly to fatty alcohols. And boy did it disagree with something in this ingredients list. This sunscreen gave me some of the worst breakouts I’ve had in a long time. Whether it was the fragrance or the plant extracts or something else I’m not sure. By a few days in, my cheeks and chin and neck were littered with intense acne. Which compared to the clear skin I’ve been sporting for the better part of a year was really concerning. After two weeks of trying to deny that this sunscreen was causing a problem I caved, and lo and behold one week without it and I’m 90% back to normal. It’s such a shame as I really loved everything about this product on paper, but in reality it didn’t work for me. You can’t use a sunscreen to prevent worsening of PIE and PIH if it’s giving you those problems. Safe to say that my boyfriend has yet another orphaned sunscreen to add to his collection (he’s so spoilt). The moral of this story is that a product can have 100 different things going for it, but if it’s incompatible with your skin it will never work for you. This review doesn’t mean it’s a bad product, but just that it isn’t for me. 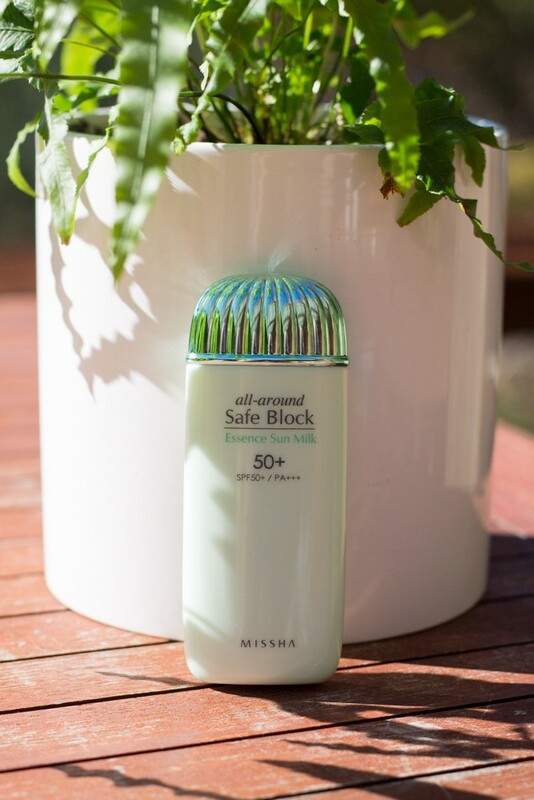 If you’d still like to try this sunscreen out as you’re less sensitive skinned than I and you’re looking for a super cosmetically elegant sunscreen, you can purchase Missha’s All Around Safe Block Essence Sun Milk here. Well, there’s something here to be learned about jumping and conclusions. Turns out that the previous reaction to this sunscreen was actually an allergic reaction to a cat that I was looking after at the same time as trying this product out. Once I was no longer around the cat, my skin cleared right back up and I’ve been using this sunscreen for the past two months with no problems! It’s now my go-to product and I love it. I hope this review was helpful to you, and I look forward to seeing you around soon!